The 70% rate might sound high, but it’s not historically unusual. Indeed, the US had a rate of 70% or higher every year between 1936 and 1981. The golden post-war era that so many Americans miss was an era of very high taxes on millionaires and billionaires. Indeed, the threshold during the bulk of this period was much lower than $10 million, even when we adjust for inflation. 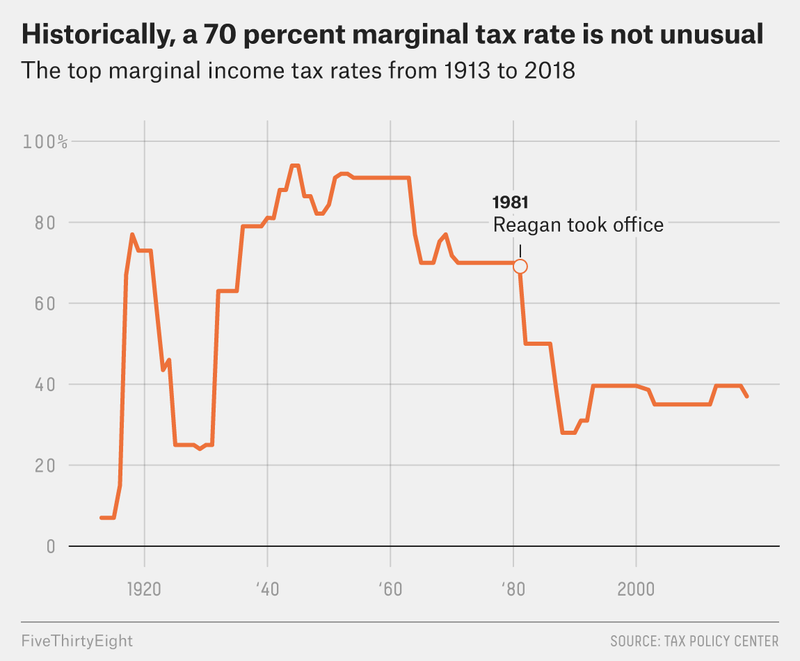 As late as 1980, the 70% tax rate applied to all income above $200k, $1.24 million in today’s dollars. In the 50s, the top rate was consistently over 90% and applied to all income above $400k, between $3 and $4 million in today’s money. Dwight Eisenhower and Richard Nixon would have considered AOC’s tax plan very right-wing, and our current tax brackets would likely have struck them as evidence that our political leaders had become sick or insane. Spending has now been reduced to near the 2007 level, and the post-2008 spike has been wiped out. If government spending is holding constant and the rich are receiving larger percentages of economic growth, the implication is that it is the ordinary American who is playing a smaller role in guiding our economic development. Our democratically-elected government spends money on the stuff ordinary Americans vote for, and ordinary Americans use their own money to buy the stuff they want. But rich people? They make guesses about what will be profitable, with no intimate knowledge of the ordinary American’s preferences. When they get it wrong, money accumulates in places where it does little good. Rich people bid up the stock market, they bid up the price of commodities, they start throwing bad loans at people who can’t pay them back, and the result is economic instability and ephemeral, fleeting growth. A higher top rate would claw some of this money back from the rich and put it back in the hands of our democracy, where our people can decide for themselves what they want to do with it. When we spend money, we tend to use it to pay ordinary people to do jobs, and those ordinary people then use that money to buy the goods and services they need. Their purchasing activity sends reliable signals to our private firms about what sort of stuff our people want and need, and that helps our rich people make smarter decisions about what to do with their remaining money, resulting in higher returns for them, albeit on a smaller base. It would also make our spending more effective. Think of it this way–if we were to fund government spending with a regressive sales tax, we would be taking money from ordinary consumers so that we could give that money to other ordinary consumers. The total amount of consumption wouldn’t change much, because we would just be moving money around among different consumers. When we start making the tax system more progressive, we start moving money from rich people to poor people. Rich people aren’t very likely to spend a high percentage of their money on real goods and services, because it doesn’t take a lot of money for them to have everything they could ever want or need. So they aren’t very efficient at generating consumer demand, and because consumer demand powers our economy they also aren’t very efficient at generating growth. When we take money from poor people to give to other poor people, we make little impact on consumption. But when we take money from rich people to give to poor people, we increase consumer demand. As Keynes would put it, poor people have a higher “propensity to consume” than rich people, so the same amount of money in a poor person’s hands generates more economic activity than the equivalent amount in a rich person’s hands. This means that a more progressive tax system increases the “fiscal multiplier” or the stimulus effect of government spending on the economy. This, by the way, is a big part of what makes People’s Quantitative Easing or “PQE” such a powerful idea. It enables the state to transfer money to poor people without taking anything at all from rich people, and therefore it increases consumer demand without any offsetting taxation or borrowing. Conventional quantitative easing, or “QE”, is much less effective, because it puts the money into the hands of rich people who don’t know how to efficiently turn that money into consumption. So if we spend money funded with PQE, the multiplier will be even higher than it would be if we borrowed it or raised it through progressive taxation, and it will be much higher than it would be if we raised it through the flat or regressive tax schemes preferred by many Republicans. The idea here is that the central bank can buy up government bonds, so that wealthy Americans don’t have to give up any of their investment liquidity to facilitate the spending and our government doesn’t have to turn to foreigners to support its investments. But whereas in conventional QE the bonds are bought primarily for the purpose of improving the cash position of rich bankers, in PQE the bonds are bought specifically to support new government spending, putting these new funds in the hands of ordinary Americans. PQE is riskier than the 70% tax because with PQE the fiscal multiplier is so high that even with relatively modest spending increases, it’s possible to generate inflation. So governments have to be a bit more cautious in how rapidly they roll out PQE, to ensure currency stability. But both of these policies could facilitate major new investments in healthcare, education, and infrastructure. Many rich people–like Michael Dell–don’t like these policies. They don’t like the 70% tax because it directly transfers wealth and decisionmaking power away from them and to our democratic institutions. They don’t like PQE because they fear even modest increases in inflation and because they want to keep our democracy dependent on them to lend it money. When we behave in ways they don’t like, they can refuse to lend money and drive up government bond yields, forcing our democratic representatives to represent them instead of us. This power disappears if we can reply with PQE, and that terrifies them. The rich can attempt to fight back by threatening to relocate themselves and their assets to other countries and jurisdictions. Over the last half-century, borders have been eroded and it’s become easier for rich people to relocate both their bodies and their capital in response to government policies they don’t like. But the United States is an especially powerful country, and it is hard for rich people to hide from it when it is roused. When Switzerland allowed its banks to hide money for wealthy Americans, the American state demonstrated how extraordinarily capable it is. It began investigating the Swiss banks, gutting Swiss laws that protected the identities of the banks’ American clients, and extracting fines and payoffs from the banks it considered responsible. This relatively minor deployment of American power reminds us that our democracy has a lot of leverage internationally and can use that leverage to protect itself from the small, opportunistic states that seek to help our rich citizens avoid paying the taxes they owe. Indeed, to this point our relatively low tax rates and relative inaction on the problem of international tax avoidance has left many of the European countries which charge higher tax rates struggling to find ways to protect their welfare states and public services. If we lifted our tax rates and began helping our allies fight tax avoidance, we could shore up our friendships around the world. It is more challenging to run high tax rates in a globalised world where rich people try to play countries off each other to avoid tax, like children playing their parents off each other in a bid to stay up late. But it can be done, especially in the United States, far and away the most powerful institution on the planet. It’s estimated that the 70% tax rate could bring in $72 billion every year. This is very close to the $75 billion it would cost to make college tuition-free. It’s enough to build President Trump’s wall nearly three times every single year. PQE could bring in piles more for AOC’s Green New Deal. Creative fiscal and monetary policy would help us do cool new things and get more bang for our buck along the way. Or we could let Michael Dell and the other posh boys keep making all our economic decisions for us. To paraphrase our president, it’s worked out great for the last 30 or 40 years, right?